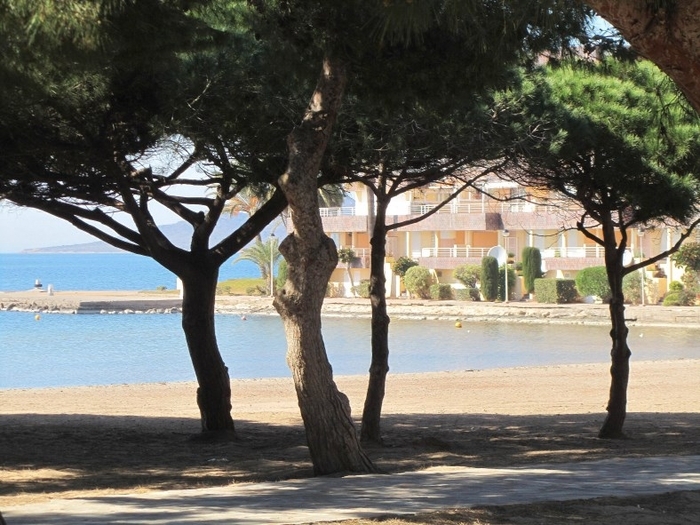 The Cala del Pino is an exception among the beaches of La Manga del Mar Menor. The area is generally associated with long stretches of golden sand and uninterrupted views either out over the Mediterranean or across the Mar Menor to the inland shore of the saltwater lagoon, flanked by unbroken residential development, but this small beach is close to being the opposite of the stereotype. Cala del Pino is a small cove on the western side of the volcanic plug which forms the highest part of La Manga, between kilometer 3 and 4, and miraculously the pine grove which grows on the lower slopes of the hill has managed to remain intact throughout the last few decades of urban development. This means that for many visitors access to the shore is down a series of stairways and the sloping path from the Plaza Calnegre area, although access is easier at the northern end of the beach where an apartment complex has been built. Nonetheless, apart from those living or staying in the beachside apartments, access for those of limited mobility is more problematic here than at many of the beaches of La Manga. There are, however, disabled parking spaces nearby and wooden ramps leading down onto the beach. However, these same characteristics also mark Cala del Pino out as one of the most attractive in La Manga, where pine trees and hillsides are rarities. Once on the beach, which only measures 150 metres by 12 metres, the visitor is able to enjoy beautiful golden sand, a children’s playground and the shaded area under the pines for a picnic or respite from the sun, and other facilities include a lifeguard and first aid hut which is manned in the summer, foot showers, drinking water, paths and slatted wooden walkways to ease access to the shore. There are opportunities to hire watersports equipment here during the summer, a summer sailing school sets up on this beach, there is a chiringuito beach bar and a play zone for children. Cala del Pino has been awarded the Q for Quality flag for the last few years in recognition of these and other services, which include a beach bar and public toilets in summer. As of August 2018 Cala del Pino is a "smart beach", having been equipped with free wi-fi connection for all visitors. 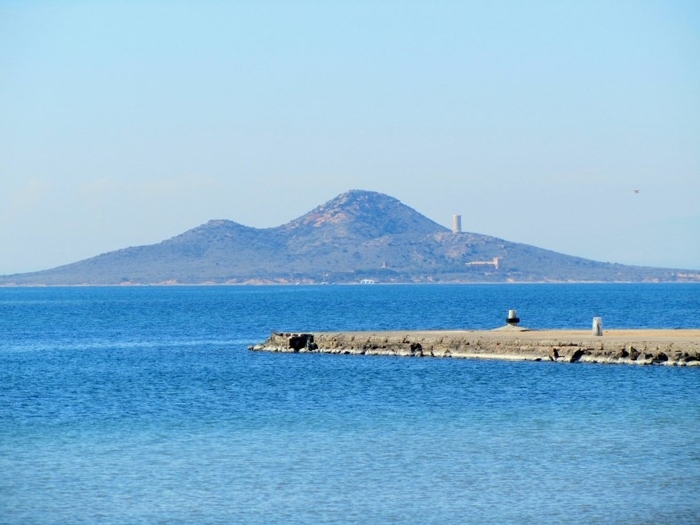 The view from the beach is an unusual one in La Manga: Los Urrutias on the opposite side of the Mar Menor is visible, but the inland side of the lagoon is partially obscured by two of the islands formed by others of the volcanic plugs which punctuate the otherwise flat eastern part of the Region of Murcia. These are the small Isla del Sujeto, which can be easily reached by swimmers, and the larger Isla Mayor, or Isla del Barón, which is a couple of kilometres away and is a popular destination for canoeists. 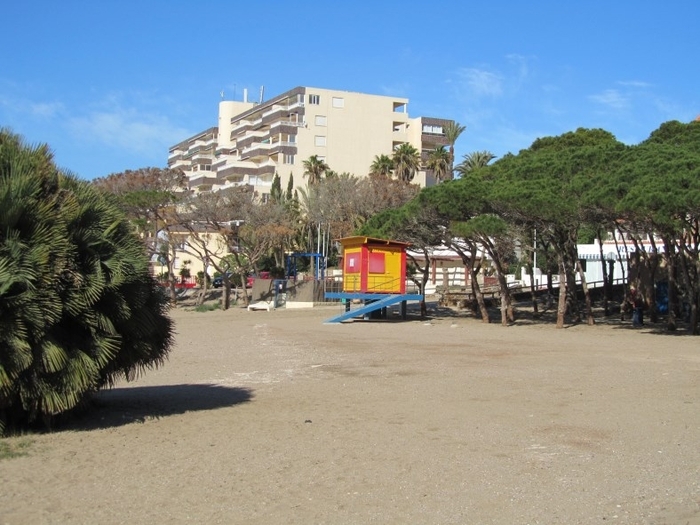 The best chances of finding a parking space nearby are along the road which goes down to the northern end of the beach, but as in the rest of La Manga during the summer spaces are, to say the least, limited. The area behind and around the beach is full of holiday apartments, and Cala del Pino is a very popular choice for sunbathers and bathers. This is not one of the parts of La Manga where the shore is lined with restaurants, so those hoping to spend the day here are advised either to bring a picnic or to be prepared for a short lunchtime drive! All in all Cala del Pino is one of the most attractive beach destinations in La Manga, precisely because it stands out from the longer stretches of sand which typify the resort, and attracts a good sprinkling of off-season visitors apart from the crowds of summer tourists. There is sometimes confusion when talking about beaches on La Manga del Mar Menor, as there are both Mar Menor beaches and Mediterranean coastal beaches on this thin strip of land, one type of beach along each side, and to make matters worse, these are divided between two different local councils, those of San Javier and Cartagena. The divide between the two is brutal; straight across the middle of "the strip" as it is often called by foreign holidaymakers, the top part belonging to San Javier and the bottom part to Cartagena. 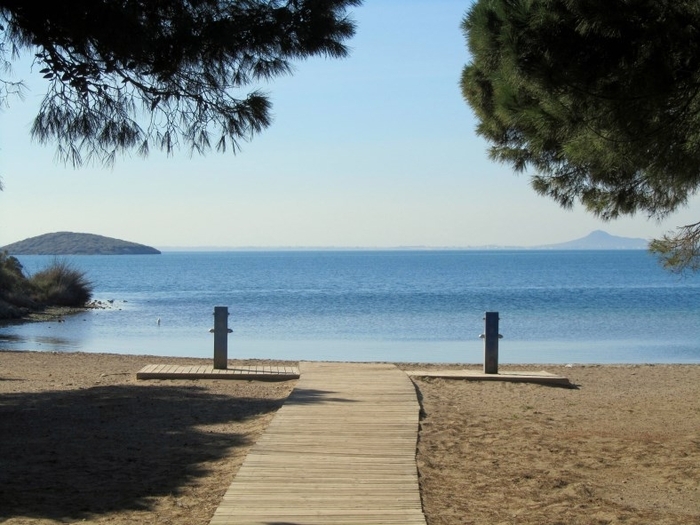 It is important when selecting a beach to understand that the Mar Menor beaches offer shallow and calm bathing conditions, whereas the Mediterranean beaches are generally wider, longer, windier, and are susceptible to wave conditions and currents. This beach is between km 3 and km 4.